By featuring, in its first issue, a massive tribute to Gary Snyder, high-tech literary magazine new has defined itself as the zone in which Zen enters the future (and vice versa).new, subtitled International Visual and Verbal Communication, is on the very edge of new media and intellect, with a large selection of poems presented in more than one language, and a selection of essays on the experience of art and design as they exist in the third millennium. At the same time, it draws heavily from the artistic and literary movements of the 20th Century, representing not a revolution or rebellion, but a progression of the artist's mindset into a new era. "new speaks to people active in all forms of expression. Our annual publication contains work adapted to print: written and visual — printed, bound, delivered. Our website connects and delivers forms of expression better suited to online presentation — interactive, multimedia, mutable. We publish work in the original language of our contributors. Where possible, we translate into English, a common language in the world today. Our areas of concern are the convergence and intersections of expression and experience. We publish contemporary work that demonstrates the urgent human need to make sense of the network of cultures we find in the present, our understandings of the past and our imaginings of the future. We are based in Paris, France, a very interesting part of the world." 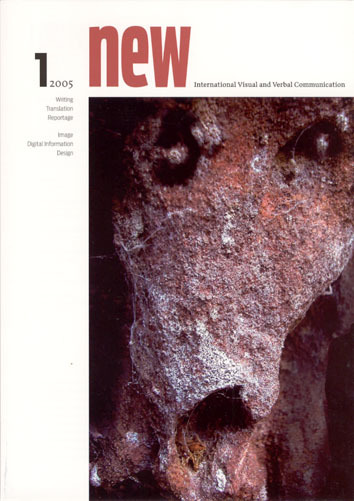 new is edited by Paul Kahn, and can be reached at www.new-mag.com, or Kahn+Associates, 90, rue des Archives, 75003, Paris. Publication is annual. Subscriptions last for two years, and can be purchased for 40 Euro or 40 USD.